Regular gifts to The Shakespeare Hospice provide funding that we can rely on. Regular and consistent income enables us to plan for the future with confidence and develop our services. It's easy to set up. You can help us to continue to provide valuable services to our community with a simple text message. The Shakespeare Hospice will recieve 100% of your donation. Please visit https://www.theshakespearehospice.org.uk/privacy-policy for the full Text to Donate terms and conditions. Want to help us raise more - just by shopping online? Well now you can with Give as you Live! 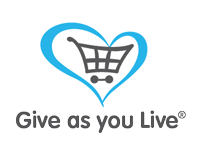 When you shop at over 4,000 top stores including Amazon, Expedia and John Lewis via Give as you Live, they'll turn a percentage of your spend into free funds for our charity! Simply sign up, search for the retailer and start shopping. It's that simple. The Hospice is open Monday to Friday 9am to 5pm if you would like to donate in person. We can accept cheques, cash or payment by credit / debit card. If you would like to make a payment directly into our bank account or over the phone by credit / debit card, please call us on 01789 266852 and ask for a member of the Fundraising Team. The Shakespeare Hospice, Church Lane, Shottery, Stratford upon Avon, Warwickshire, CV37 9UL. Please do not send cash via post.